Nigerian skipper Austin 'Jay-Jay' Okocha has won his first international award after being voted the 2003 BBC African Footballer of the Year. He wins the award ahead of Juventus' Ghanaian international Stephen Appiah and Samuel Eto'o, the Cameroon striker who plays for Spanish side Real Mallorca. Okocha topped the poll of readers of the BBC African football website and listeners of the BBC World Service's African sports programme, Fast Track. 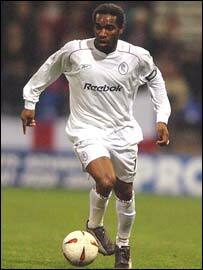 "I've been expecting something like this for a very long time," a delighted Okocha told BBC Sport. "I'd got to the stage where I thought that I'd never win an award in my career, so I'm very happy to be recognised in this way." Okocha, who has been in excellent form for English Premiership club Bolton Wanderers in the 2002 season, added that he "appreciates" the support he has received from African football fans throughout his career. He said: "I've always received letters of encouragement from them and I hope to keep playing well in order to pay them back for their faith in me." Okocha was also full of praise for his two runners-up, describing Appiah and Eto'o as "worthy ambassadors of the African game" in Europe. "We didn't know much about Appiah before but now that he has become a regular with Juventus, he's really shown what he's capable of. "As for Eto'o, we all know that he's been consistent for his club and country over the last few years."